"Color film" redirects here. For the motion picture equivalent, see Color motion picture film. Color photography was attempted beginning in the 1840s. Early experiments were directed at finding a "chameleon substance" which would assume the colour of the light falling on it. Some encouraging early results, typically obtained by projecting a solar spectrum directly onto the sensitive surface, seemed to promise eventual success, but the comparatively dim image formed in a camera required exposures lasting for hours or even days. The quality and range of the colour was sometimes severely limited mainly to primary colours, as in the chemically complicated "Hillotype" process invented by American daguerreotypist Levi Hill around 1850. Other experimenters, such as Edmond Becquerel, achieved better results but could find no way to prevent the colours from quickly fading when the images were exposed to light for viewing. Over the following several decades, renewed experiments along these lines periodically raised hopes and then dashed them, yielding nothing of practical value. In 1886 Lippmann's interest had turned to a method of fixing the colors of the solar spectrum on a photographic plate. On 2 February 1891, he announced to the Academy of Sciences: "I have succeeded in obtaining the image of the spectrum with its colors on a photographic plate whereby the image remains fixed and can remain in daylight without deterioration." By April 1892, he was able to report that he had succeeded in producing color images of a stained glass window, a group of flags, a bowl of oranges topped by a red poppy and a multicolored parrot. He presented his theory of color photography using the interference method in two papers to the academy, one in 1894, the other in 1906. It is based on the Young-Helmholtz theory that the normal human eye sees color because its inner surface is covered with millions of intermingled cone cells of three types: in theory, one type is most sensitive to the end of the spectrum we call "red", another is more sensitive to the middle or "green" region, and a third which is most strongly stimulated by "blue". The named colors are somewhat arbitrary divisions imposed on the continuous spectrum of visible light, and the theory is not an entirely accurate description of cone sensitivity. But the simple description of these three colors coincides enough with the sensations experienced by the eye that when these three colors are used the three cones types are adequately and unequally stimulated to form the illusion of various intermediate wavelengths of light. In his studies of color vision, Maxwell showed, by using a rotating disk with which he could alter the proportions, that any visible hue or gray tone could be made by mixing only three pure colors of light – red, green and blue – in proportions that would stimulate the three types of cells to the same degrees under particular lighting conditions. To emphasize that each type of cell by itself did not actually see color but was simply more or less stimulated, he drew an analogy to black-and-white photography: if three colorless photographs of the same scene were taken through red, green and blue filters, and transparencies ("slides") made from them were projected through the same filters and superimposed on a screen, the result would be an image reproducing not only red, green and blue, but all of the colors in the original scene. 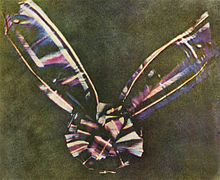 The first color photograph made according to Maxwell's prescription, a set of three monochrome "color separations", was taken by Thomas Sutton in 1861 for use in illustrating a lecture on color by Maxwell, where it was shown in color by the triple projection method. The test subject was a bow made of ribbon with stripes of various colors, apparently including red and green. During the lecture, which was about physics and physiology, not photography, Maxwell commented on the inadequacy of the results and the need for a photographic material more sensitive to red and green light. A century later, historians were mystified by the reproduction of any red at all, because the photographic process used by Sutton was for all practical purposes totally insensitive to red light and only marginally sensitive to green. In 1961, researchers found that many red dyes also reflect ultraviolet light, coincidentally transmitted by Sutton's red filter, and surmised that the three images were probably due to ultra-violet, blue-green and blue wavelengths, rather than to red, green and blue. This is also known as the CMYK color model. The "K" is a black component normally added in ink-jet and other mechanical printing processes to compensate for the imperfections of the colored inks used, which ideally should absorb or transmit various parts of the spectrum but not reflect any color, and to improve image definition. The production of photographic three-color prints on paper was pioneered by Louis Ducos du Hauron, whose comprehensive 1868 French patent also included the basic concepts of most of the color photographic processes which were subsequently developed. For making the three color-filtered negatives required, he was able to develop materials and methods which were not as completely blind to red and green light as those used by Thomas Sutton in 1861, but they were still very insensitive to those colors. Exposure times were impractically long, the red or orange-filtered negative requiring hours of exposure in the camera. His earliest surviving color prints are "sun prints" of pressed flowers and leaves, each of the three negatives having been made without a camera by exposing the light-sensitive surface to direct sunlight passing first through a color filter and then through the vegetation. His first attempts were based on the red-yellow-blue colors then used for pigments, with no color reversal. Later he used the primary colors of light with color reversal. As long as photographic materials were usefully sensitive only to blue-green, blue, violet and ultraviolet, three-color photography could never be practical. In 1873 German chemist Hermann Wilhelm Vogel discovered that the addition of small amounts of certain aniline dyes to a photographic emulsion could add sensitivity to colors which the dyes absorbed. He identified dyes which variously sensitized for all the previously ineffective colors except true red, to which only a marginal trace of sensitivity could be added. In the following year, Edmond Becquerel discovered that chlorophyll was a good sensitizer for red. Although it would be many more years before these sensitizers (and better ones developed later) found much use beyond scientific applications such as spectrography, they were quickly and eagerly adopted by Louis Ducos du Hauron, Charles Cros and other color photography pioneers. Exposure times for the "problem" colors could now be reduced from hours to minutes. As ever-more-sensitive gelatin emulsions replaced the old wet and dry collodion processes, the minutes became seconds. New sensitizing dyes introduced early in the 20th century eventually made so-called "instantaneous" color exposures possible. The first type used a system of partially reflecting surfaces to divide the light coming through the lens into three parts, each part passing through a different color filter and forming a separate image, so that the three images could be photographed at the same time on three plates (flexible film had not yet replaced glass plates as the support for the emulsion) or different areas of one plate. Later known as "one-shot" cameras, refined versions continued to be used as late as the 1950s for special purposes such as commercial photography for publication, in which a set of color separations was ultimately required in order to prepare printing plates. The second type, known variously as a multiple back, repeating back or drop back camera, still exposed the images one at a time but used a sliding holder for the filters and plates which allowed each filter and the corresponding unexposed area of emulsion to be quickly shifted into place. German photochemistry professor Adolf Miethe designed a high-quality camera of this type which was commercially introduced by Bermpohl in 1903. It was probably this Miethe-Bermpohl camera which was used by Miethe's pupil Sergei Mikhailovich Prokudin-Gorskii to make his now-celebrated color photographic surveys of Russia before the 1917 revolution. One sophisticated variant, patented by Frederic Eugene Ives in 1897, was driven by clockwork and could be adjusted to automatically make each of the exposures for a different length of time according to the particular color sensitivities of the emulsion being used. Otherwise simple cameras with multiple color-filtered lenses were sometimes tried, but unless everything in the scene was at a great distance, or all in a plane at the same distance, the difference in the viewpoints of the lenses (parallax) made it impossible to completely "register" all parts of the resulting images at the same time. The most extensive and expensive of the two was the "Kromskop" (pronounced "chrome-scope") system developed by Frederic Eugene Ives. This was a straightforward additive system and its essential elements had been described by James Clerk Maxwell, Louis Ducos du Hauron and Charles Cros much earlier, but Ives invested years of careful work and ingenuity in refining the methods and materials to optimize color quality, in overcoming problems inherent in the optical systems involved, and in simplifying the apparatus to bring down the cost of producing it commercially. The color images, dubbed "Kromograms", were in the form of sets of three black-and-white transparencies on glass, mounted onto special cloth-tape-hinged triple cardboard frames. To see a Kromogram in color it had to be inserted into a "Kromskop" (generic name "chromoscope" or "photochromoscope"), a viewing device which used an arrangement of colored glass filters to illuminate each slide with the correct color of light and transparent reflectors to visually combine them into a single full-color image. The most popular model was stereoscopic. By looking through its pair of lenses, an image in full natural color and 3-D was seen, a startling novelty in the late Victorian age. The results won near-universal praise for excellence and realism. At demonstrations, Ives sometimes placed a viewer displaying a still-life subject next to the actual objects photographed, inviting direct comparison. A Kromskop triple "lantern" could be used to project the three images, mounted in a special metal or wooden frame for this purpose, through filters as Maxwell had done in 1861. Prepared Kromograms of still-life subjects, landscapes, famous buildings and works of art were sold and these were the Kromskop viewer's usual fodder, but a "multiple back" camera attachment and a set of three specially adjusted color filters could be bought by "Kromskopists" wishing to make their own Kromograms. The simpler and somewhat more economical alternative was the Joly Screen process. This required no special camera or viewer, just a special color-compensating filter for the camera lens and a special holder for the photographic plates. The holder contained the heart of the system: a clear glass plate on which very fine lines of three colors had been ruled in a regular repeating pattern, completely covering its surface. The idea was that instead of taking three separate complete photographs through three colored filters, the filters could be in the form of a large number of very narrow strips (the colored lines) allowing the necessary color information to be recorded in a single compound image. After the negative was developed, a positive transparency was printed from it and a viewing screen with red, green and blue lines in the same pattern as the lines of the taking screen was applied and carefully aligned. The colors then appeared as if by magic. The transparency and screen were very like the layer of monochrome liquid crystal elements and overlay of hair-thin red, green and blue color filter stripes which create the color image in a typical LCD display. This was the invention of Irish scientist John Joly, although he, like so many other inventors, eventually discovered that his basic concept had been anticipated in Louis Ducos du Hauron's long-since-expired 1868 patent. The Joly Screen process had some problems. First and foremost, although the colored lines were reasonably fine (about 75 sets of three colored lines to the inch) they were still disturbingly visible at normal viewing distances and nearly intolerable when enlarged by projection. This problem was exacerbated by the fact that each screen was individually ruled on a machine which used three pens to apply the transparent colored inks, resulting in irregularities, high reject rates and high cost. The glass used for photographic plates at the time was not perfectly flat, and lack of uniform good contact between the screen and the image gave rise to areas of degraded color. Poor contact also caused false colors to appear if the sandwich was viewed at an angle. Although much simpler than the Kromskop system, the Joly system was not inexpensive. The starter kit of plate holder, compensating filter, one taking screen and one viewing screen cost US$30 (the equivalent of at least $750 in 2010 dollars) and additional viewing screens were $1 each (the equivalent of at least $25 in 2010 dollars). This system, too, soon died of neglect, although in fact it pointed the way to the future. The first commercially successful color process, the Lumière Autochrome, invented by the French Lumière brothers, reached the market in 1907. Instead of colored strips, it was based on an irregular screen plate filter made of three colors of dyed grains of potato starch which were too small to be individually visible. The light-sensitive emulsion was coated directly onto the screen plate, eliminating problems due to imperfect contact between the screen and image. Reversal processing was used to convert the negative image which was initially produced into a positive image by removing the exposed silver metal, and re-exposing the remaining silver halide, so no printing or screen registration was required. 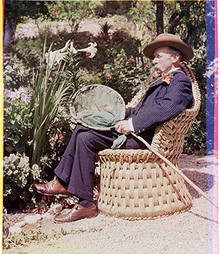 The shortcomings of the Autochrome process were the expense (one plate cost about as much as a dozen black-and-white plates of the same size), the relatively long exposure times which made hand-held "snapshots" and photographs of moving subjects impractical, and the density of the finished image due to the presence of the light-absorbing color screen. Millions of Autochrome plates were manufactured and used during the quarter century before the plates were replaced by film-based versions in the 1930s. The very last film version, named Alticolor, brought the Autochrome process into the 1950s but was discontinued in 1955. Many additive color screen products were available between the 1890s and the 1950s, but none, with the possible exception of Dufaycolor, introduced as film for still photography in 1935, was as popular or successful as the Lumière Autochrome. The most recent use of the additive screen process for non-digital photography was in Polachrome, an "instant" 35mm slide film introduced in 1983 and discontinued about twenty years later. Louis Ducos du Hauron had suggested using a sandwich of three differently color-recording emulsions on transparent supports which could be exposed together in an ordinary camera, then taken apart and used like any other set of three-color separations. The problem was that although two of the emulsions could be in contact face-to-face, the third would have to be separated by the thickness of one transparent support layer. Because all silver halide emulsions are inherently sensitive to blue, the blue-recording layer ought to be on top and have a blue-blocking yellow filter layer behind it. This blue-recording layer, used to make the yellow print which could most afford to be "soft", would end up producing the sharpest image. The two layers behind it, one sensitized to red but not green and the other to green but not red, would suffer from scattering of the light as it passed through the topmost emulsion, and one or both would further suffer by being spaced away from it. Despite these limitations, some "tripacks" were commercially produced, such as the Hess-Ives "Hiblock" which sandwiched an emulsion on film between emulsions coated on glass plates. For a brief period in the early 1930s, the American Agfa-Ansco company produced Colorol, a roll-film tripack for snapshot cameras. The three emulsions were on unusually thin film bases. After exposure, the roll was sent to Agfa-Ansco for processing and the triple negatives were returned to the customer with a set of color prints. The images were not sharp and the color was not very good, but they were genuine "natural color" snapshots. "Bipacks" using only two emulsions face-to-face were the subject of some development. Although the range of colors which could be reproduced by only two components was limited, skin tones and most hair and eye colors could be rendered with surprising fidelity, making bipack processes a viable option for color portraiture. In commercial practice, however, the use of bipacks was almost entirely confined to two-color motion picture systems. In 1935, American Eastman Kodak introduced the first modern "integral tripack" color film and called it Kodachrome, a name recycled from an earlier and completely different two-color process. Its development was led by the improbable team of Leopold Mannes and Leopold Godowsky, Jr. (nicknamed "Man" and "God"), two highly regarded classical musicians who had started tinkering with color photographic processes and ended up working with the Kodak Research Laboratories. Kodachrome had three layers of emulsion coated on a single base, each layer recording one of the three additive primaries, red, green, and blue. In keeping with Kodak's old "you press the button, we do the rest" slogan, the film was simply loaded into the camera, exposed in the ordinary way, then mailed to Kodak for processing. The complicated part, if the complexities of manufacturing the film are ignored, was the processing, which involved the controlled penetration of chemicals into the three layers of emulsion. Only a simplified description of the process is appropriate in a short history: as each layer was developed into a black-and-white silver image, a "dye coupler" added during that stage of development caused a cyan, magenta or yellow dye image to be created along with it. The silver images were chemically removed, leaving only the three layers of dye images in the finished film. In 1941, Kodak made it possible to order prints from Kodachrome slides. The print "paper" was actually a white plastic coated with a multilayer emulsion similar to that on the film. These were the first commercially available color prints created by the chromogenic dye coupler method. In the following year, Kodacolor film was introduced. Unlike Kodachrome, it was designed to be processed into a negative image which showed not only light and dark reversed but also complementary colors. The use of such a negative for making prints on paper simplified the processing of the prints, reducing their cost. Instant color film was introduced by Polaroid in 1963. Like Polaroid's contemporary instant black-and-white film, their first color product was a negative-positive peel-apart process which produced a unique print on paper. The negative could not be reused and was discarded. The blight created by carelessly discarded caustic-chemical-laden Polaroid negatives, which tended to accumulate most heavily at the prettiest, most snapshot-worthy locations, horrified Polaroid founder Edwin Land and prompted him to develop the later SX-70 system, which produced no separate negative to discard. Some currently available color films are designed to produce positive transparencies for use in a slide projector or magnifying viewer, although paper prints can also be made from them. Transparencies are preferred by some professional photographers who use film because they can be judged without having to print them first. Transparencies are also capable of a wider dynamic range, and therefore of a greater degree of realism, than the more convenient medium of prints on paper. The early popularity of color "slides" among amateurs went into decline after the introduction of automated printing equipment started bringing print quality up and prices down. Other currently available films are designed to produce color negatives for use in creating enlarged positive prints on color photographic paper. Color negatives may also be digitally scanned and then printed by non-photographic means or viewed as positives electronically. Unlike reversal-film transparency processes, negative-positive processes are, within limits, forgiving of incorrect exposure and poor color lighting, because a considerable degree of correction is possible at the time of printing. Negative film is therefore more suitable for casual use by amateurs. Virtually all single-use cameras employ negative film. Photographic transparencies can be made from negatives by printing them on special "positive film", but this has always been unusual outside of the motion picture industry and commercial service to do it for still images may no longer be available. Negative films and paper prints are by far the most common form of color film photography today. After a transition period centered around 1995–2005, color film was relegated to a niche market by inexpensive multi-megapixel digital cameras which can shoot both in monochrome as well as color. Film continues to be the preference of some photographers because of its distinctive "look" and fondness of the format. John Hedgecoe, another photographer who lived during this time period,[vague] was another example of those who preferred color. He published a book entitled The Art of Color Photography, in which he explained the importance of understanding the "special and often subtle relationships between different colors". He also described the psychological and emotional power that color can have on the viewer, since certain colors, he argues, can make people feel a certain way. This worry was not uncommon. Photographer Ansel Adams, known best for his dramatic black-and-white landscapes, also felt that color could be distracting, and could therefore divert the artist's attention away from creating a photograph to his full potential, according to some experts. Adams actually claimed that he could get "a far greater sense of 'color' through a well-planned and executed black-and-white image than [he had] ever achieved with color photography". Another expert source[vague] mentioned that Adams was a "master of control". He wrote books about technique, developed the Zone System—which helped determine the optimal exposure and development time for a given photograph—and introduced the idea of "previsualization", which involved the photographer imagining what he wanted his final print to look like before he even took the shot. These concepts and methods allowed for nearly total control of all the potential variables that factor into a final print. Because of this love for control, Adams disliked color because it lacked this element that he had mastered with black-and-white. Highlight staining occurs with older color photographic papers, and is a yellowing of the border and highlight areas of a photograph. In general, the colder the storage, the longer the "life" of color photographs. Frost-free refrigeration, more commonly known as cold storage (below freezing) is one of the most effective ways to bring a halt to developing damage to color photographic materials. Selecting this type of storage environment is costly and requires special training to remove and return items. Therefore, cool storage (above freezing) is more common and less costly, which requires that the temperature is consistently between 10–15 °C (50–59 °F) with 30–40% relative humidity with special attention to dew point to eliminate concerns for condensation. General dark storage in light tight enclosures and storage boxes is always advised for individual items. When materials are exposed to light during handling, usage, or display, light sources should be UV-filtered and intensity kept at minimum. In storage areas, 200–400 lux is recommended. Paper enclosures should be non-acidic, lignin-free paper and may come in either buffered or non-buffered stock. An advantage of paper is that it is generally less costly than plastic enclosures. The opaque quality of paper protects photographs from light exposure, and the porous quality protects photographs from humidity and gaseous pollutants. However, for images to be viewed, they must be removed from the enclosure, putting the materials at risk for mishandling and/or vandalism. Archival quality plastic enclosures are made of uncoated polyester, polypropylene, or polyethylene. The transparent quality of plastic lends itself to easier access to the image because there is no extra step to remove the photograph. Plastic is also less resistant to tears in comparison to paper. Some disadvantages include being prone to static electricity and a risk of ferrotyping (the act of moisture becoming trapped between the enclosure and item, causing the materials to stick to one another). Wikimedia Commons has media related to Color photography. ^ Shepherd, Sanger. Provisional Catalogue of Apparatus and Materials for Natural Colour Photography: Sanger Shepherd Process. Archive.org. Retrieved 26 October 2015. ^ Hudson, Giles (2012). Sarah Angelina Acland: First Lady of Colour Photography. Oxford: Bodleian Library, University of Oxford. ISBN 978 1 85124 372 3. Retrieved 16 January 2013. Distributed by The University of Chicago Press in the US. ^ a b "From Charles Mackintosh's waterproof to Dolly the sheep: 43 innovations Scotland has given the world". The independent. 30 December 2016. ^ From Nobel Lectures, Physics 1901–1921, Elsevier Publishing Company, Amsterdam, 1967. ^ Jacques Bintz, "Gabriel Lippmann 1845–1921", in Gabriel Lippmann: Commémoration par la section des sciences naturelles, physiques et mathématiques de l’Institut grand-ducal de Luxembourg du 150e anniversaire du savant né au Luxembourg, lauréat du prix Nobel en 1908 (Luxembourg: Section des sciences naturelles, physiques et mathématiques de l’Institut grand-ducal de Luxembourg en collaboration avec le Séminaire de mathématique et le Séminaire d’histoire des sciences et de la médecine du centre universitaire de Luxembourg, 1997), Jean-Paul Pier & Jos. A. Massard: éditeurs, Luxembourg 1997. Retrieved 4 December 2010. ^ Maxwell, James Clerk (1855). "Experiments on colour, as perceived by the eye, with remarks on colour-blindness". Transactions of the Royal Society of Edinburgh. XXI part II. Retrieved 2014-07-06. ^ "The first colour photograph, 1861". The Guardian. 3 January 2017. ^ R.W.G. Hunt (2004). The Reproduction of Colour, 6th edition. Wiley. pp 9–10. R.M. Evans (1961b). “Maxwell's Color Photography”. Scientific Photography 205. pp 117–128. ^ Vogel, H: "On the sensitiveness of bromide of silver to the so-called chemically inactive colours", Chemical News, December 26, 1873:318–319, copying from The Photographic News, date and page not cited but apparently December 12, 1873 (the latter not known to be available online as of August 6, 2010), in turn translated from Vogel's own publication Photographische Mittheilungen, December, 1873 10(117):233–237. The capital letters used in this and other sources cited refer to the Fraunhofer lines in the solar spectrum, in keeping with contemporary practice. For convenience of reference: C is 656 nm, a slightly deeper red than the output of an average red laser pointer; D is 589 nm, the orange-yellow light of a sodium vapor lamp; E is 527 nm, green. ^ Vogel, H: "Photo-spectroscopic researches", The Photographic News, March 20, 1874:136–137, translated from Photographische Mittheilungen, February, 1874 10(119):279–283. ^ Vogel, H: "Rendering actinic non-actinic rays", The Photographic News, July 3, 1874:320–321, a direct communication (apparently in the original English) to The Photographic News. ^ Becquerel, E: "The action of rays of different refrangibility upon the iodide and bromide of silver: the influence of colouring matters", The Photographic News, October 23, 1874:508–509, translated from Comptes Rendus (1874) 79:185–190 (the latter downloaded from the Bibliotheque Nationale Francaise on January 28, 2006 but not directly linkable). Note one significant error in the Photographic News translation, page 509: "...vigorous band between the rays C and D" (referring to Fraunhofer lines) should be "C and B" per the original French text and in agreement with subsequent mentions in the translation. ^ Ives, F: Kromskop Color Photography, pages 33–35. The Photochromoscope Syndicate Limited, London, 1898. Only a brief description of this automated camera is given but a line drawing of the mechanism and the patent reference are included. An Ives one-shot camera is described and illustrated on pages 30–33 and a horizontally oriented multiple back attachment is illustrated on page 37. ^ Abney, W: "Orthochromatic photography", Journal of the Society of Arts, May 22, 1896 44:587–597 describes and illustrates (with spectrum photographs and curves) the characteristics of the Lumière Panchromatic and Cadett Spectrum plates as of 1896. Note that during this period "orthochromatic" was not intended to mean "red-blind", although most or all commercial products so labeled indeed were, which may explain the subsequent evolution in the meaning of the word. The wild roller-coaster curves necessitated laborious adjustment and testing of the color filters to obtain the three desired curves. In the cases of the red and green filters, that could mean quashing over ninety-nine percent of the overall sensitivity, requiring exposures measured in seconds under circumstances where one-fiftieth of a second would have sufficed for unfiltered monochrome use. Disproportionate blue sensitivity, requiring the use of a yellow filter for accurate monochrome rendition in daylight, was typical of commercial panchromatic emulsions far into the 20th Century. See also the previously referenced Ives, F: Kromskop Color Photography, price list (following page 80) pages 1–2, and the subsequently referenced Joly, J: "On a method...", page 135 for mentions of the use of the Lumière Panchromatic in those systems. The alternative alluded to in Ives may be the Cadett Spectrum but could also be the Edwards Isochromatic, only slightly sensitive to red, which Ives is on record as having employed at an earlier date. The Cadett Lightning Spectrum plate, with an improved spectral response curve and greatly increased overall speed, was available by mid-1900. ^ Joly, J: "On a method of photography in natural colors", Scientific Transactions of the Royal Dublin Society, October, 1896 6(2):127–138 includes details such as the actual reasons for the unusual colors employed in the taking screen and examples of the exposures required. The color illustrations have obviously had considerable hand-work done by the engravers and may have been entirely hand-colored using the original transparencies as a guide. As is evident from page 127, publication was delayed by more than a year. The 1895 date is confirmed by the publication of a lengthy abstract in Nature, November 28, 1895 53(1361):91–93. ^ Honan, William (March 26, 2000). "Ferenc Berko, 84, Pioneer In Use of Color Photography". The New York Times. ^ Hedgecoe, John (1998). The Art of Color Photography. Reed Consumer Books. ^ a b Tuley, Laura Camille (December 2007). "An Interview with Harold Baquet" (PDF). New Orleans Review. 33 (2): 108–116. Retrieved March 21, 2012. ^ Woodward, Richard B. (November 2009). "Ansel Adams in Color". Smithsonian. ^ "Ansel Adams: Browse". Center for Creative Photography. University of Arizona. ^ ELLIE ZOLFAGHARIFARD (15 October 2013). "How medieval stained-glass is creating the ultimate SPACE camera: Nanoparticles used in church windows will help scientists see Mars' true colours under extreme UV light". Dailymail.co.uk. Retrieved 2015-10-26. Coe, Brian, Colour Photography: the first hundred years 1840–1940, Ash & Grant, 1978. Eastman Kodak Company. (1979). Preservation of photographs. Kodak publication, no. F-30. [Rochester, N.Y.]: Eastman Kodak Co.
Reilly, J. M. (1998). Storage guide for color photographic materials. Albany, N.Y.: University of the State of New York ... [et al.]. Wikisource has the text of the 1921 Collier's Encyclopedia article Color Photography.